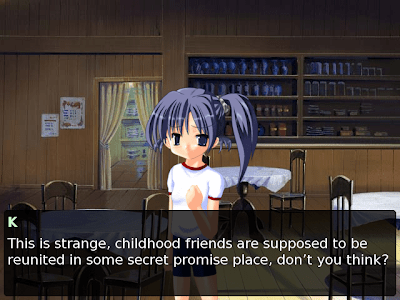 A Childhood Friend: A VN review | FULL MOE PANIC!!! This is the first time I’ve played a doujin visual novel and honestly, I didn’t really know what to expect from it. But it my faith in shinji’s work was justified when I played it. K then decides to take a couple of days of from work to return to his old hometown to relieve himself of the daily grind of life. When he arrives in his hometown, he notices that much has changed and his old house was no longer where it used to stand. 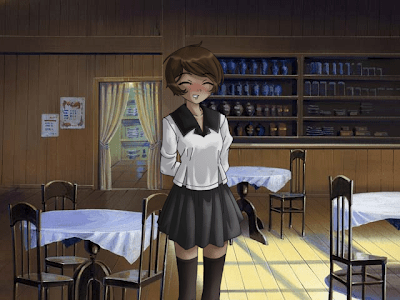 K then decides to go to a local café and get a drink where he meets a mysterious girl whom he feels a connection with. After a brief conversation they promised to meet each other in the same place again the next day, After awhile, Hisa-chan in her loli form came into the café and began to talk to K in earnest about life and how people are too preoccupied and fail to appreciate the simple things in life. Hisa-chan then disappears after walking out of the café. The next day, the girl whom K made the promise with did not turn up and it was beginning to rain so he decided run through it and fell face first when he hit a trashcan. The girl then appeared and helped him to a nearby bus station. K was clearly in awe of the girl but somehow he could not string together a coherent conversation with her and ended up making himself look even weirder. Finally K manages to get the girl’s name before she departs to the next city. Her name was Hisa. A grown up Hisa-chan is fine too. Back from his refreshing trip, K gets ready for his daily commute to work but on trai station platform he saw Hisa on the opposite platform when a train sped by and all he could see was his own reflection. The story in itself is rather simple, boy thinks of girl, boy goes back to find girl and boy meets girl again and falls in love. It kind of reminds me of Kanon where Yuuichi has ties to Ayu through a shared memory. I personally think the story could use some extra details such as why was K forced to leave the city 10 years ago? It also seemed too short for a full novel. Character wise, this story’s main characters are rather interesting. K is portrayed quite well as the world-weary otaku salary man. He even throws a few otaku references. (Watch out for it, really had me LOLed) Hisa in loli form was also quite interesting as I take that she is K’s inner conscience and innocence. The adult Hisa on the other hand projects the perfect image of a woman of Mystery, never giving up information unless asked to do so. A few suggestions I might like to add though is to extend the story and add in an arc for when they meet in the city again as adults and add in some romance ala Hachikuro and I think you will have a recipe for pure win. P.S. if you want a copy of this just drop shinji a line at hi blog here. This entry was posted in Otaku, VN. Bookmark the permalink. Oro? Those two girls are one and the same person? I think there will be more added and possibly an explanation for the sudden leave when there is more added to the game ^^. @D-Blade: it seems that the younger Hisa was sort of an Imaginary character that appears when K feels depressed to push him on the right path. @shinji: good idea. i’ll get to work on it if im free. university is a real killer i tell you. ill go talk to as about this and hopefully something constructive will come out of it. Pingback: Project SVN Completed at hisashiburi!